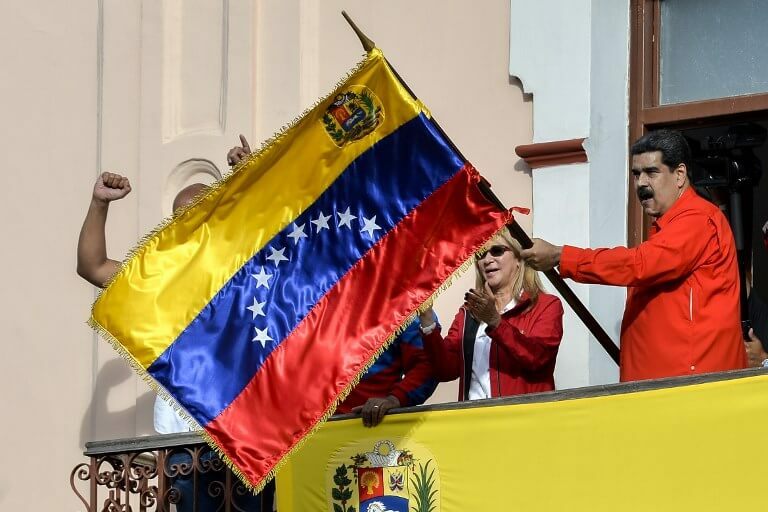 Venezuela’s President Nicolas Maduro has rejected a European ultimatum that he call elections as opposition rival Juan Guaido stepped up appeals to the military to turn against the leftist government. Spain, Britain, France, Netherlands and Germany warned Saturday they will recognise Guaido as interim president unless Maduro calls elections within eight days. Greece’s left-wing ruling Syriza party, however, voiced full support for Maduro. ‘They should withdraw this ultimatum. No one can give us an ultimatum,’ Maduro told CNN Turk in an interview dubbed into Turkish from Spanish. ‘Venezuela is not tied to Europe. This is complete insolence,’ Maduro added, as he described the European countries’ actions as a ‘mistake’. Guaido, the 35-year-old head of the opposition-controlled National Assembly, declared himself acting president at a massive anti-government rally in Caracas on Wednesday, contending that Maduro’s re-election to a second six-year term was fraudulent. The United States, Canada and many Latin American countries which had refused to recognise Maduro’s May 2018 re-election immediately endorsed Guaido as the interim president, setting up the tense showdown in crisis-torn Venezuela. In the interview with CNN Turk, Maduro accused the US of mounting a coup attempt against him – a regular refrain – and insisted Guaido was ‘violating the constitution’. ‘All that is happening is linked to America. They are attacking us and they think Venezuela is their back garden,’ Maduro said. Although he professed himself ‘open to dialogue,’ he acknowledged it was unlikely. ‘I sent many messages to Donald Trump,’ he said. In Washington, Republican Senator Marco Rubio, considered a key architect of the US policy on Venezuela, played down the possibility of a military intervention despite his and Trump’s warnings earlier in the week that ‘all options are on the table.’. ‘I don’t know of anyone calling for military intervention,’ Rubio said. Guaido has aimed his appeals at the Venezuelan military, with promises of amnesty and mass protests to dramatize the depth of popular opposition to Maduro, who has presided over a virtual collapse of the economy and a worsening humanitarian crisis. The military has thus far been the most important pillar of support for leftist regime, which was ushered into power more than 20 years ago by the late Hugo Chavez. The first major military officer to publicly switch his support to Guaido was Venezuela’s military attache in Washington, Army Colonel Jose Luis Silva. In a video posted online Saturday Silva urged ‘my brothers in the national armed forces’ to recognise Guaido ‘as the only legitimate president,’ in accordance with Venezuela’s constitution. At a Caracas rally the Guaido said he would announce a date for ‘a grand march,’ and called on supporters to circulate copies of amnesty measures approved by the National Assembly to friends and relatives in the military. At a special UN Security Council session Saturday, US Secretary of State Mike Pompeo described Maduro as part of an ‘illegitimate mafia state’ responsible for Venezuela’s economic collapse. He accused Russia and China of ‘propping up a failed regime in the hopes of recovering billions of dollars in ill-considered investments and assistance made over the years’. Russia denounced the United States for interference. ‘Venezuela does not pose any threat to peace and security. The intention of the United States is to orchestrate a coup d’etat,’ said Russia’s UN ambassador Vassily Nebenzia. Kremlin spokesman Dmitry Peskov, meanwhile, on Sunday denied reports that 400 members of a private Russian military group were in Venezuela to protect Maduro. Maduro earlier gave US diplomats until late Saturday to leave Venezuela. Washington said it was ignoring the order as it no longer considered Maduro the president – but withdrew non-essential staff and argued that Maduro still bore responsibility for diplomats’ safety. As the deadline expired, Maduro said he had begun negotiations to set up within 30 days an Interests Section in Caracas to maintain a minimum level of diplomatic contact, similar to the arrangement the US had with Cuba until their 2015 rapprochement. ‘We have no plans to close the embassy,’ a State Department official said Sunday. ‘Our priority remains the safety and protection of our personnel and US citizens overseas. ‘Interim President Guaido has invited the US mission to remain in Venezuela. We will continue to evaluate the situation on the ground and determine appropriate action,’ the official said.